*As of April 1, 2019 two condominium homes are available for purchase. A-1 is a 900+ sq foot, 1+ bedroom unit for $309,000. D-4 is 1200+ sq ft, 2+ bedroom, 1.5 bath unit for $349,000. Both are upper units facing south with lots of light. Please check on our web site, www.woodardlanecoho.org. 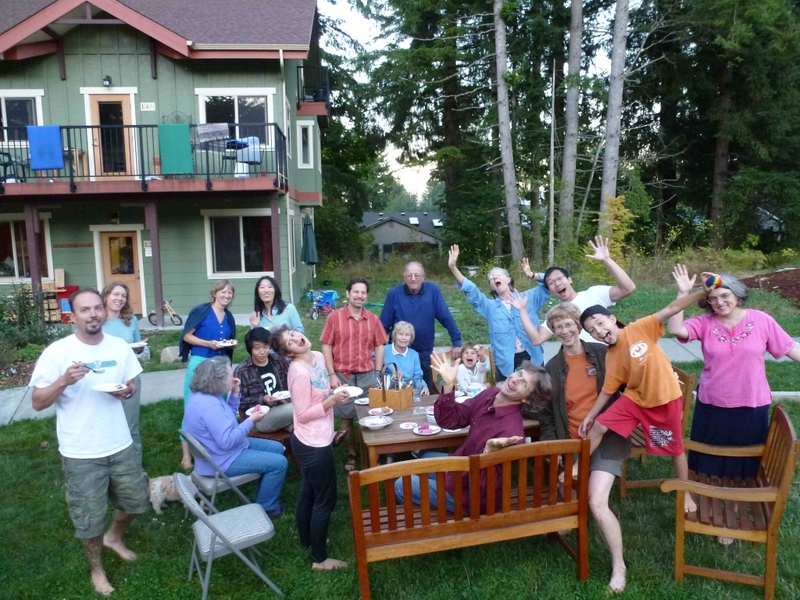 Our loving and vibrant community has been living together for 9 years. We share meals, conversations, helping hands, babysitting, song circles and the joy of connection. We are tucked into the edge of a ravine, within walking distance of downtown Olympia, but in a lovely older neighborhood. In 2016, we completed the 2nd and final phase of our construction project, which expanded us from 11 to 18 units. The approximately 50 members range in age from 1 to 88. Our site is on Olympia's West Side, just 1.6 miles from downtown, and 6 blocks from the beloved Westside Olympia food coop. Part of our land is a green belt provided by a deep ravine sculpted by a year-round stream that enters Puget Sound several blocks away. We currently have a large vegetable garden and play areas for the kids. All of our homes surround a Center Green where we gather to talk, walk our dogs, ride bikes and scooters, and enjoy the sunshine. Our legal structure is a condominium with a Steering Board made up of two members from each of the working committees – Building Maintenance, Grounds, Administration, and Community Life.